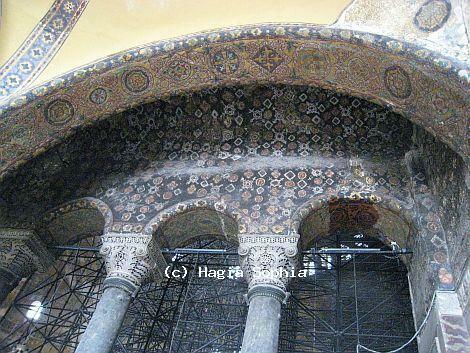 Hagia Sophia was beautifully decorated with mosaics within the centuries during Byzantine period. These mosaics depicted Virgin Mary, Jesus, saints and emperors or empresses. The history of the earliest mosaics is unknown as many of them were destroyed or covered during Iconoclasm. The known ones start from the reestablishment of orthodoxy and reach its height during the reigns of Basil I and Constantine VII. During the fourth crusade in 1204, Latin Crusaders sacked many Byzantine buildings including Hagia Sophia. Many beautiful mosaics were removed and shipped to Venice. After the Ottoman occupation of Constantinople in 1453, with the transition of Hagia Sophia into mosque, the mosaics were covered whitewashed or plastered. With Fosatti brothers’ restoration in 1847, the mosaics got uncovered and were copied for record. But they still remained covered until 1931 when a restoration and recovery program began under the leadership of Thomas Whittemore. In 1934, Mustafa Kemal Ataturk ordered that Hagia Sophia would become a museum, the recovery and restoration expanded then. However, many of the great mosaics that Fosatti brothers recorded had disappeared probably with the earthquake in 1894.